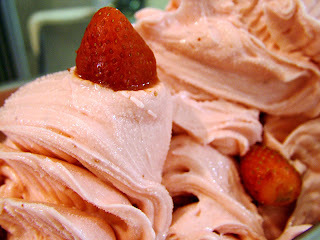 I found a really great wholesome recipe for strawberry ice cream on another blog that I enjoy. Kelly the Kitchen Kop featured this one day not long ago. I tried it and the whole family loved it. In fact, my husband who would never choose strawberry ice cream declared it the best ice cream he had ever tasted. I'm pretty sure that you could substitute other fruits for the strawberries. Blueberries are in season here in Michigan and I might make a batch with blueberries just for fun. What I really like about this recipe is all the wholesome ingredients. It's definitely an occasional treat, but I don't feel so bad when I see all the great whole foods that it contains. Combine these ingredients and stir gently. Let set for 2 hours (or overnight). Strain the berries, reserving juices and then mash or puree half the berries. In another bowl, mix these ingredients together. Pour all ingredients into the bowl of a 2 quart ice cream maker and process according to manufacturers instructions. About 5 minutes before mixing is complete, add the reserved sliced strawberries.